The City of Harrisonville presented the Life Saver Award to three people at the April 15, Board of Aldermen meeting. The awards were be presented to Myles Lemon, a 15-year-old lifeguard at the Harrisonville Community Center and Linda Hipp (Victoria Valdez was unable to attend the event), for their heroic efforts in saving 54-year-old Mark Thompson, who collapsed while playing basketball at the Community Center in February. WATCH: To see video of the presentations, click here. On Sunday, February 17, Thompson was shooting free throws in the gymnasium after playing in a full-court basketball game, when he says he remembers seeing the ball leave his hand and then everything going black. Thompson fell face down on the court. He was having a heart attack. Multiple people who had been playing with Thompson, including Myles and Valdez’s boyfriend, ran to where Thompson had fell. Valdez, who was starting a job as a nurse at a Kansas City hospital the next day, was called over, quickly assessed Mark, found he had no pulse, was not breathing and began performing chest compressions. Hipp, a nurse in the Harrisonville School District, was not in the gym but noticed the commotion and, after asking if she could be of assistance, quickly jumped in to help Valdez. Myles, who had been trained in CPR, remained with Mark and would take turns with Valdez and Hipp if one of them became tired. An AED machine was brought from the front desk but suffered a battery issue and, while Valdez and Hipp continued chest compressions, Myles quickly ran to find another. When he returned, Myles continued compressions as the pads were placed on Thompson’s chest and then stepped back as a shock was administered. Thompson’s pulse quickly returned and less than two minutes later, EMTs and Paramedics from Harrisonville Emergency Services arrived on the scene. Thompson was placed on a gurney and rushed to the emergency room at St. Luke’s East Hospital, in an ambulance. Harrisonville Fire Chief Eric Myler confirmed the latter part of Thompson’s statement, when they sat down together to discuss the traumatic event a few weeks later at the Harrisonville Emergency Services building. “Those people who did chest compressions on you, they saved your life.” Myler said. Doctors say Thompson’s diet was the primary reason for his heart attack, as Mark said he frequently drank large amounts of dark soda and chowed down on candy. Thompson says he was grateful that when the heart attack did happen, he was surrounded by people who could help. 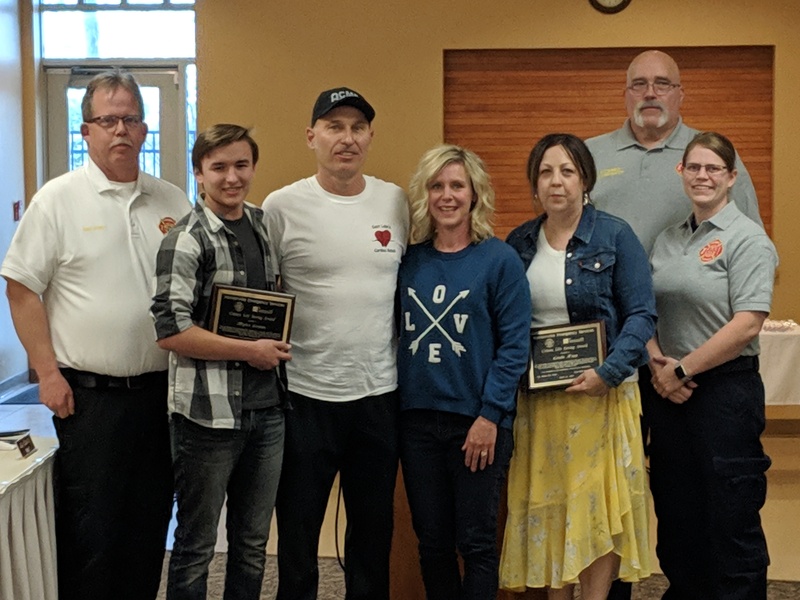 Thompson and his wife Betsy handed out the awards to recognize Myles, Hipp and Valdez for their efforts and as a way for Mark to say, "Thank you," for saving his life. During the ceremony, paramedics Rachel Corr and Tom Ratterman, were also recognized for their efforts on that February day. Both Thompson and Myler praised the knowledge and training possessed by those who assisted Mark and spoke to the incredible value of CPR training. Myler also spoke about the value of hands-only CPR, which was used to save Thompson. To learn more about hands-only CPR, click here.